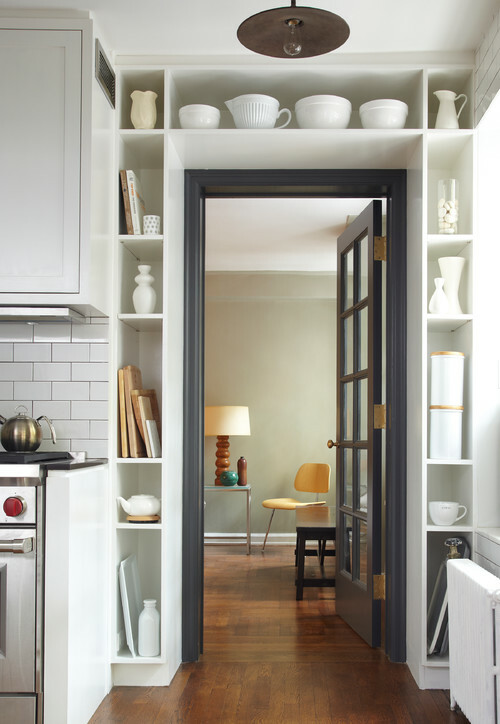 I love when built-in storage and architectural detail is tucked into little nooks and crannies in a home. Built-ins are not only charming but oh-so-practical, especially in small spaces where furniture can feel crowded. My far away dream is to build a house with custom built-ins everywhere. How fun would that be? So for a little fun weekend dreaming, here are seven ideas for clever and charming built-ins. 1) Don’t waste an inch. Yes, there could have been just regular drywall around that door (above). But why have a plain ordinary wall next to a door when you can have fun cubbies for trays, breadboards and pretty bowls? 2) Hallways can be more than just a pass through. If your hallway or stairway landing is wide enough, I think tucking in a library would be the most charming idea. I mean, I would vote for a library in any room of the house, but something about this hallway just makes me certain I would forget where I was headed and find myself lost in a novel all afternoon. 3) Doggie mudrooms should be a must. OK, so at our house we are forever carrying dogs upstairs to wash off their muddy feet and faces after fun in the rain. But this idea? 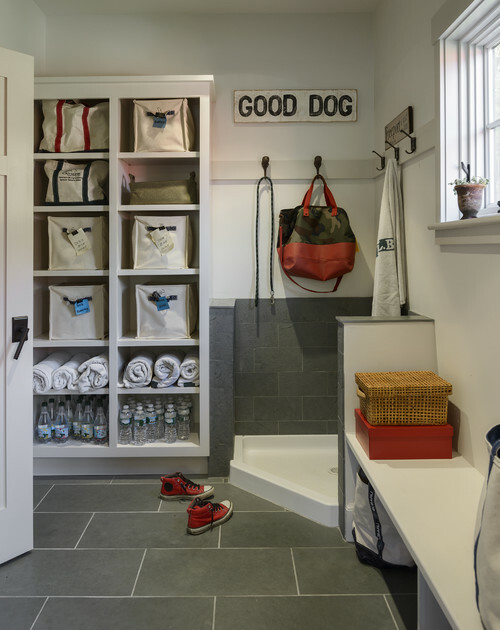 Imagine this perfect doggie shower tucked into a corner of the garage or a mudroom, with built-in space for dog towels and accessories. I vote yes for this. 4) Efficiency can be charming, too. 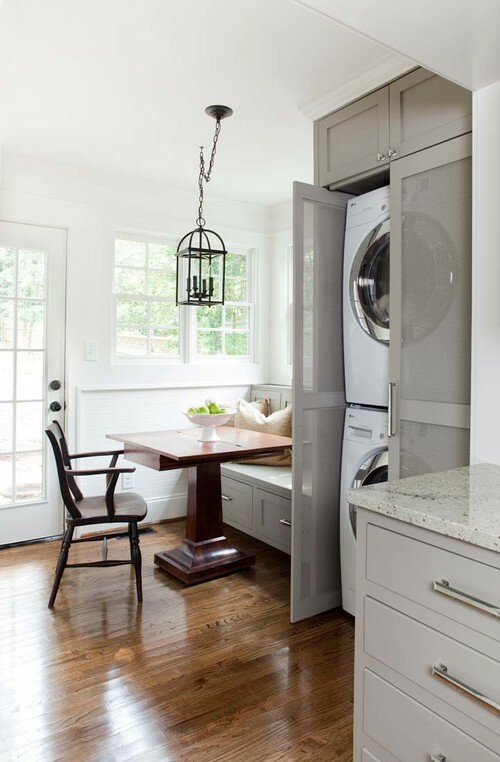 So if you don’t have the extra space for a dedicated laundry room, this could be an efficient way to keep up with your laundry while you fix dinner or drink your morning coffee! Many of us don’t have the luxury of spacious rooms for every thing we want or need in our home, so you might as well make efficiency in small spaces feel charming and intentional. 5) Little nooks with big style. Dying. I love this built-in desk under the window, surrounded by bookshelves and drawers. What could be more inspiring than a charming spot designed to sit and write a letter, catch up on reading or writing, or pay a bill? 6) Why be ordinary if you can be special? So I love the little built-in bookcase space next to the stairs. 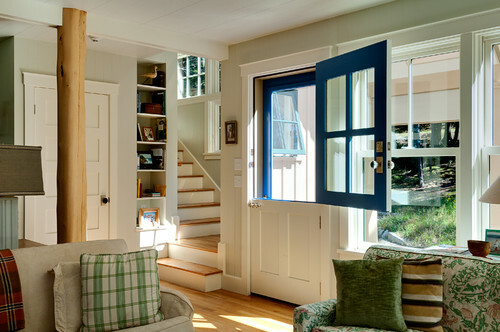 But I can’t help but be drawn to the dutch door, too. While maybe it wouldn’t be what most of us think in when we say “built-in” it is a functional, practical and delightful feature to include in a home. 7) Built-in beds and bookcases are a win in small spaces. 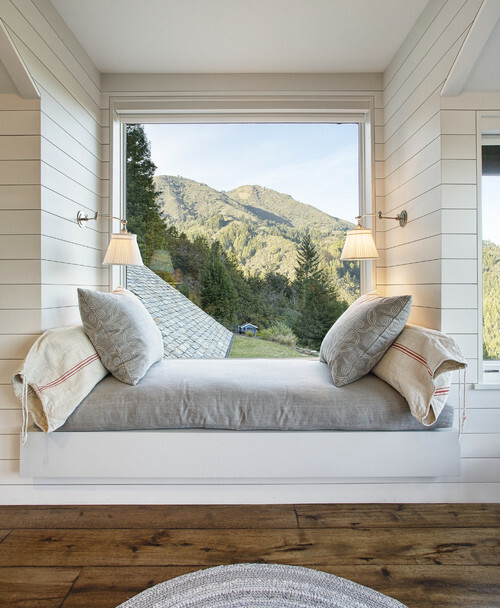 I mean, can you imagine daydreaming the afternoon away in a built-in bed cubby like this? Okay, if you could have just one of these built-ins in your home, which would you pick? I would pick the hall library. And the bed nook. And the Dutch door! I’m sorry. Did you say pick just one? It’s my dream, so I decided that one wasn’t enough! Thanks for the blog and book inspiration. We finished our school year yesterday, and I celebrated by starting to “putter and de clutter”! It was fun! Ha! I too could not pick one. I tried and realized I would need them all :). Enjoy your summer! YAY! Sage, your makeover is adorable. I totally agree, so often what we want is RIGHT THERE! It just takes a little contemplation and creativity to find it. Thanks for sharing!! I’m inspired. I really like the cubbies around the kitchen door. I think it is practical but can also be pretty & it’s such a efficient use of space. I do really like the built-in bed (if we ever had a large enough attic or a garage to build over top of, we could create a cute guest space that way. I also like the hallway library but rarely ever see such wide hallways. They’re all epic ideas – but the dog shower gets 5*s from me! So need a mud room! All wonderful ideas, but the hall library!! I want to be right there! My blood pressure goes down just looking at it. The video adds on your site have become a problem lately. They keep taking me back to that part of the screen. I can’t read an entry, and it did it 15 times while I tried to type this. I thought you should know, though, so I persisted! Please fix this so more people can actually enjoy your site like we used to do. Thanks! How annoying! I’m sorry you have had trouble, were you on a mobile phone or a computer? I’ll get on it right away to see what can be fixed, thanks so much for letting me know! I definitely want you to enjoy your experience here :)! Love the doggie mudroom. That would be so useful! I love this post, some lovely inspiration. I am a storage nerd and tomorrow we have a new addition to the family – not a child, not a dog – a bookcase! I will blog about it because I am very excited to have somewhere to put my books that I can actually see, beyond excited. YES! That is such exciting news…I know just how you feel about having a bookcase. That is going to be an AMAZING addition!! The bed nook for sure! Followed by the library hallway! Love it all though! I love the built in bed with the big window and mountain view but I would not position those lamps there. You can’t sit up and read because the lamps are way too low. Looks like you’d have the lamp resting on your head if you attempted to read in bed. I also like the breakfast nook one, though I don’t like the washer/dryer setup with one on top of the other. I would definitely pick the “doggie room” for sure! With having the GoldenDoodle, it would be so nice to have a room like this!! #6 – Everthing about that is so inviting, from the bookshelf nook, to the front door, to the layout of room & staircase. Dreamy! The hall way of books for sure. I love that you can see the steps and spindles. Next would be the desk alcove. The nooks are all awesome but the houses they are in are even more awesome! and the light and flow of that pretty room. The hall library is magic. that doggie mudroom is a dream! Wish wish wish I had a doggie mudroom with the shower!!! Make life so much easier! All of these look AMAZING! 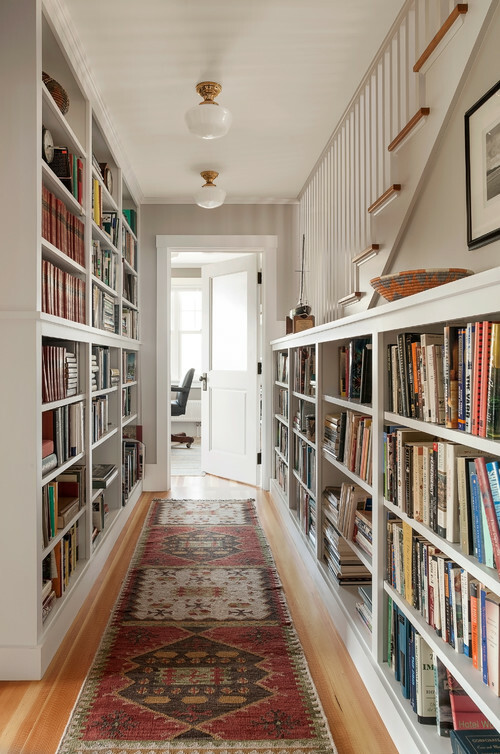 I especially love the hallway of bookshelves – living the dream there! Thanks for sharing these. Melissa, I don’t even have a dog (I’m a cat person!) but I’d almost get one just to make use of that mudroom with the doggie shower! :D But, oh, that hallway library … that’s for me! I love the inclusion of books everywhere! The fact that anyone has to carry their dogs to wash off their feet tells me that the family needs a new plan for their animal management. ASAP.